These photos aren't fair, are they? 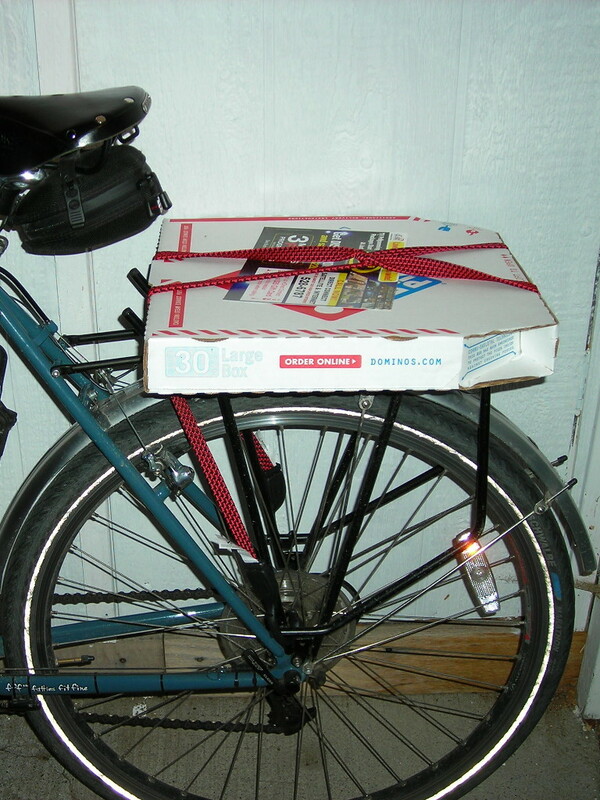 Carrying a boxed pizza on a narrow rear cargo rack (spring 2008). One of the many challenges facing utility cyclists is the need to carry a wide range of objects without the assistance of a motor vehicle. Surprisingly enough, almost anything you wish to carry can be done using a bike! Don't believe me? You might appreciate a visit to Bicycle Cargo: Chapter 1, Chapter 2, Chapter 3, and Chapter 4. Using a variety of methods, from cargo racks, panniers and trailers to messenger bags and backpacks, chances are you'll be able to haul most of what you'd need to carry on a daily basis without ever putting your key in the ignition. One challenge I've faced is coming up with a method to carry a non-frozen pizza without all of the toppings falling off. 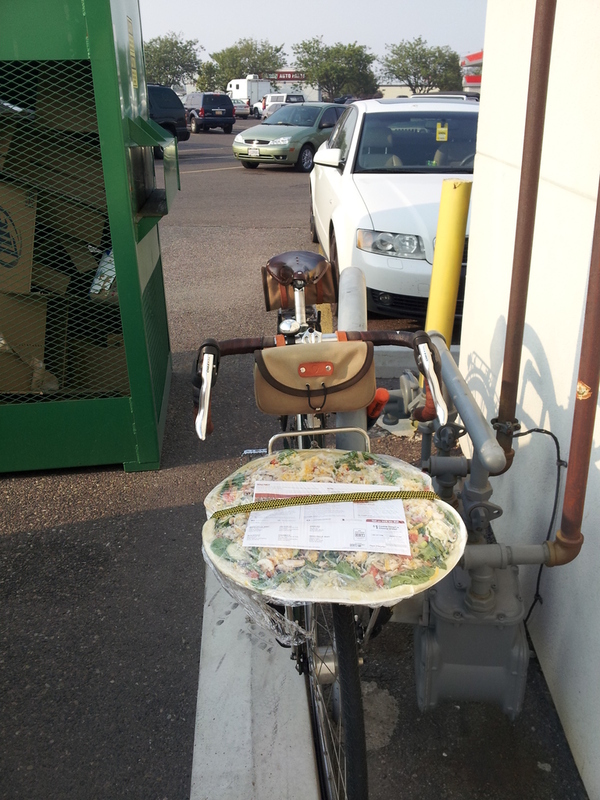 Placing a boxed pizza vertically in a pannier, messenger bag or backpack would produce amusing results, to say the least. Unless you want to eat DiGiorno or delivery for the rest of your bicycling career, another method must be used. Fortunately, there are a handful of very simple and obvious options available right off the bat. The most obvious is to use a cargo or child trailer, which will certainly have enough area to place a take-and-bake or carryout pizza flat for travel. With a trailer, all you need is a bit of planning to be sure you're hitched up for the errand. However, more spontaneous pie cravings on the commute home from work might leave you with a frown on your face. Enter the porteur rack. These racks sit on the front of the bike, as low to the wheel as possible, and have a wide surface area. They were traditionally used in Paris to deliver newspapers — purportedly up to 110lbs! These racks are great for hauling packages, beer, and other boxy things. You can also strap a backpack or messenger bag to them when you're getting tired. While it's certainly possible to do this on a rear rack, you typically don't have the same surface area to work with, nor can you keep a close eye on your cargo. I have actually strapped a carryout pizza box to a rear Tubus Cargo with good results, but this wouldn't work very well with a flimsy take-and-bake unless an additional box or platform is used. 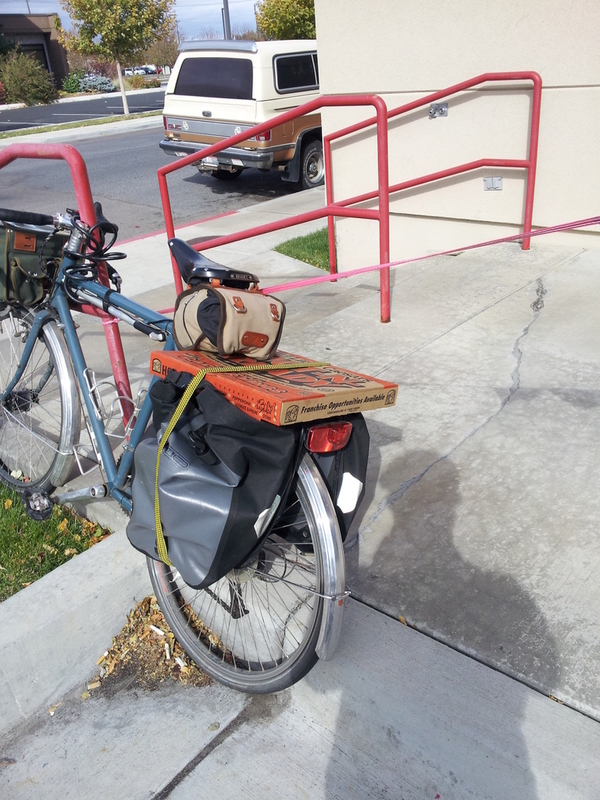 Without any extra gear, aside from a bungee cord, you can strap a pizza directly to the rack and take it home. 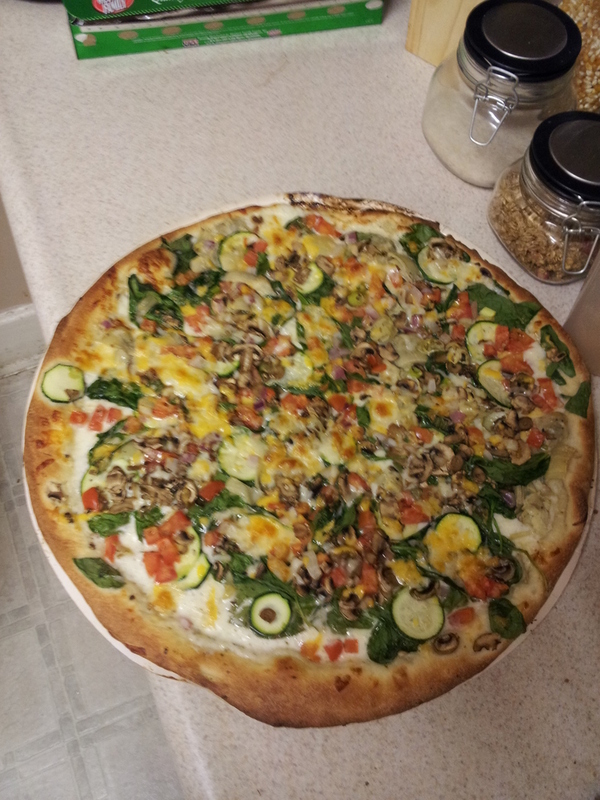 I've hauled numerous pizzas this way, including a 16" family size take-and-bake, with great success. The monster-sized family pizzas would benefit from a fairly large porteur rack, but even a modest 14.2" by 11.4" rack can get the job done — the pizza just hangs off the edge a bit, and the sides get a little pinched. Careful with speed bumps! A do-it-yourself platform made of lightweight plastic or cardboard would alleviate any caveats. Porteur racks benefit from handlebars that do not extend past the stem, unlike traditional drop handlebars, to make room for tall, wide boxes. However, drop bars cause little interference for the types of things I typically carry using this method. Your mileage may vary, depending on your needs. These racks are not typically something you can find mass produced at Walmart, or even many local bike shops, so they do cost a bit more than you might expect. I've provided a few I'm familiar with for your convenience, but you may have to do a bit of searching if you're on a budget. Be sure to contact me if I've missed any, and I'll add them to the list! Now go hitch that child trailer gathering dust in your garage, or grab a pimped-out porteur bike and get some pie! Very useful and retro-stylish addition to a bike. You could probably pick up a chick on it (literally). Just don't slam on your brakes too hard. :-) Or I guess you could install some seat belts on it! Very useful links too, by the way. I'll probably refer back to this article if I ever encounter a hauling-by-bicycle predicament! Since all I have is a rear rack, I suggest adding side horizontal supports for boxless pizzas... be it kickstands, antenna fingers, or dowels. I know it can do it! Go rear rack! :-) I do submit that the porteur rack sounds better for this purpose, and it makes me want a porter beer every time I think of it too.